Good food, roaring fires, nights under the stars, and entertaining classes about the state’s natural history – all of this and more are part of Wildlife Weekend, Feb. 1-3, in Michigan’s north woods. The DNR and the Michigan Alliance for Environmental and Outdoor Education have teamed up to create this fun learning experience at the Ralph A. MacMullan Conference Center on scenic Higgins Lake in Roscommon County. DNR education manager Kevin Frailey is excited about this development. 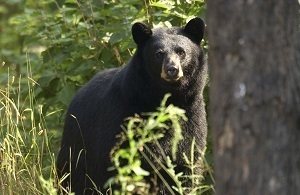 Mammal Mania is taught by Holt High School teacher Bill Hodges, who described the class as a “great chance to become an expert on Michigan mammals and learn their behaviors, tracks and identification.” Updates on bears, wolves, cougars and more are included. In between classes, there will be plenty of time to enjoy the area’s gorgeous scenery, explore trails, borrow some snowshoes and just get back in touch with nature. Classes begin at 7 p.m. Friday and run through noon Sunday. Get more information and register online at maeoe.com. Questions? Contact Kevin Frailey at fraileyk@michigan.gov or 517-284-6043. This winter fishing season, DNR creel clerks again will be out and about at many fishing spots to interview anglers about the details of their trips. Most interviews take just a few minutes, but the critical information gathered makes a big difference to successful fisheries management. “‘Anglers’ is just another word for the people who fish, and ‘creel clerks’ is a term for the people who talk to anglers about their fishing trips,” said Tracy Claramunt, a fisheries biologist who runs the DNR’s Statewide Angler Survey Program, a long-term monitoring program that tracks recreational fisheries across Michigan waters of the Great Lakes and select inland waters. Claramunt said that the word creel comes from the name for an old-fashioned basket that fishermen used to keep their catch in, and creel clerks were the folks who’d stop and ask the fishermen what they caught. Today’s survey model works much the same way. DNR creel clerks ask anglers, through brief interviews, about how long they fished, what species they targeted, what they caught and where they live. Statewide, clerks talk fishing with roughly 80,000 people a year. Sometimes the clerks might ask to measure or weigh fish and take scale samples to gather key biological information on those fish. These data help fisheries managers make decisions about fishing regulations, habitat improvement and fish-stocking needs. 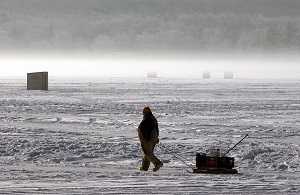 This winter creel clerks plan to talk with anglers fishing Saginaw Bay, Lake St. Clair, the Les Cheneaux Islands, Munising, Marquette, Keweenaw Bay, Lac Vieux Desert, Otsego Lake and Little Bay de Noc. Starting April 1 and continuing into the fall, creel clerks will interview anglers at Great Lakes boating access sites, fishing piers and shorelines across the entire coastline to get estimates on spring, summer and fall fisheries. 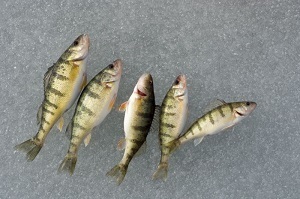 Learn more about creel clerks and anglers surveys on the DNR webpage Michigan.gov/FishResearch. Questions? Contact Tracy Claramunt, 517-282-2887 or claramuntt@michigan.gov or Elyse Walter, 517-284-5839 or waltere@michigan.gov. 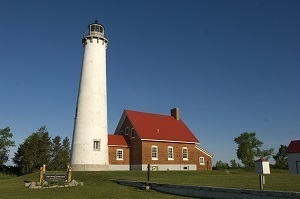 Michigan offers the best in outdoor experiences every season of the year, but it's good to remember that each season comes with its own unique opportunities and considerations. If you're planning to spend time at state parks this winter (at the start of state parks' centennial anniversary year), think ahead about what you'll need to ensure a safe, memorable time for you and your friends and family. 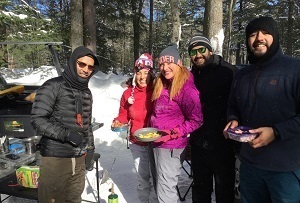 A trio of visitors to Tahquamenon Falls State Park in the eastern Upper Peninsula were reminded of this recently when a hike on a relatively mild winter day turned into a hazardous situation. ... Read the full story. Get some great ideas on where to go and what to do at Michigan.gov/WinterFun. Help wish Michigan a happy 182nd birthday during "A Statehood Day Celebration" Jan. 26 at the Michigan History Museum in downtown Lansing. Crafts, demos, re-enactors, music, euchre and more! If you've been visiting managed waterfowl hunt areas around the state as part of the Wetland Wonders Challenge, remember to turn in or mail your punch cards by Feb. 22 for your chance at some great prizes. Time to renew your license plate? Consider getting a wildlife habitat specialty license plate that gives much-needed support to Michigan's endangered, threatened and nongame wildlife and native plants.